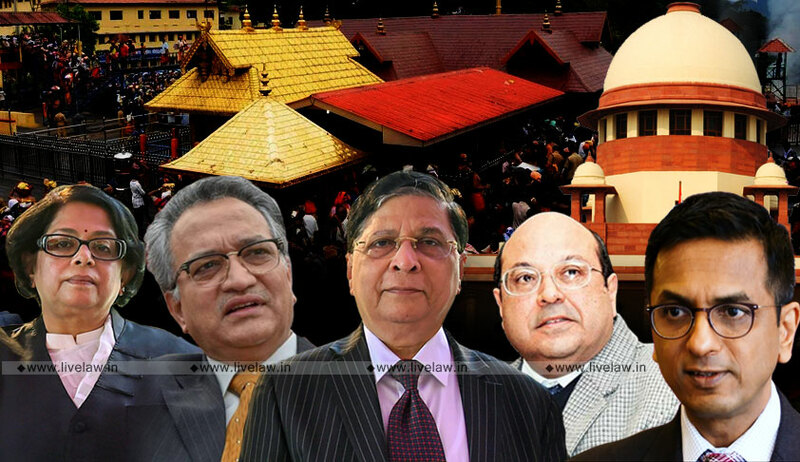 The Supreme Court has delivered one of the most keenly awaited judgment in Sabarimala case. by a 4:1 majority, the Court has permitted entry of women of all age groups to the Sabarimala temple, holding that 'devotion cannot be subjected to gender discrimination'. The lone woman in the bench, Justice Indu Malhotra, dissented. Chief Justice Dipak Misra, Justice R F Nariman, Justice A M Khanwilkar and Justice D Y Chandrachud constituted the majority. "Women is not lesser or inferior to man. Patriarchy of religion cannot be permitted to trump over faith.Biological or physiological reasons cannot be accepted in freedom for faith Religion is basically way of life however certain practices create incongruities", the Chief Justice read out portions of the judgment written for himself and Justice A M Khanwilkar. The judgment of the CJI also held that Ayyappa devotees will not constitute a separate religious denomination. Rule 3(b) of the Kerala Hindu Places of Public Worship(Authorization of Entry) Rules 1965, which prohibited entry of women in Sabarimala, was also struck down as unconstitutional. The separate but concurring opinion of Justice Nariman held : "Anything destructive of individuality is anachronistic of Constitutionality. To treat women as lesser people blinks at the Constitution itself". It was held that Ayyappas do not constitute a separate religious denomination. Justice Chandrachud in his separate but concurring opinion held that the idea behind the ban was that presence of women will disturb celibacy, and that was placing burden of men's celibacy on women. This stigmatises and stereotypes women, he observed. Justice Indu Malhotra, in her lone dissent, held that issues of deep religious sentiments should not be ordinarily be interfered by the Court.Court should not interfere unless if there is any aggrieved person from that section or religion.Notion of rationality should not be seen in matters of religion. She also held that shrine and the deity is protected by Article 25 of Constitution of India. The Bench was delivering the Judgment in a 2006 PIL filed by Indian Young Lawyers Association challenging the centuries-old tradition of Sabrimala Temple banning entry of women of menstruating age inside the temple. The eight-day long marathon hearing was privy to a debate on the ‘essential religious practices’ doctrine and the principle of constitutional morality- Justice D. Y. Chandrachud observed that abstinence is a state of mind and to restrain women from pursuing their right to worship on physiological grounds would be unconstitutional. Countering The submission of historic religious beliefs and customary practices, he asserted that after the coming into force of the Constitution, all actions have to be tested on the touchstones of equality and liberty. The judge had regarded the ‘essentiality’ principle, originating in the 1954 five-judge Bench decision in Shirur Mutt, as a “problem with our jurisprudence”. He had criticised it for compelling judges to be guided by the theological aspect- whether a practice is deemed essential in terms of the tenets of the religion- rather than whether it is conducive to the Constitution. He was of the view that regardless of the ‘essentiality’ of a practice to the religion, discrimination cannot be allowed in violation of the basic structure of the constitution. Concurring, Justice Rohinton Nariman emphasised that contemporaneous morality is dynamic. He ventured that if constitutional morality was taken recourse to, the practice would not survive. Chief Justice Dipak Misra had reflected that one visits a temple by virtue of their belief and devotion, and that the onus to prove the rationality and reasonableness would be on those imposing the prohibition. He commented that despite there being innumerable Lord Jagannath temples, the one in Puri continues to attract worshippers in hoards. Justice Nariman had weighed in that the ban on women between the ages of 10 and 50 years could not be said to be justified as in certain cases, a woman might be menopausal at an earlier age. The judge noted that at some point, female devotees are permitted access to the temple. He indicated the stand of the Travancore Devaswom Board before the Kerala High Court in S. Mahendran v. Secretary, Devaswom Board- The Board had contended that the restriction of entry is only during the Mandalam, Maharavilakku and Vishu days and that temple will be open in every month for five days. According to the Board, persons who go to the temple during these days are not expected to observe the penance for any particular period. For decades, Many female worshippers of the age group of 10 to 50 used to go to the temple during these days for the first rice-feeding ceremony of their children. “What happens to the celibate nature of Lord Ayyappa in those 5 days? Is it that the idol vanishes on those days?”, inquired Justice Nariman rhetorically. Further, Justice Nariman pointed out the anomalies that in one of the affidavits the duration of the customary penance is asserted to be 55 days as opposed to the claim before the apex court of the inability of women to observe the customary 41-days ‘Vrathams’, and that none of the affidavits imputed the ban to a belief of impurity. Accordingly, Justice Chandrachud had remarked that the custom could not be said to satisfy the requirement of being continuously and consistently in existence from times immemorial. The bench also wondered how a Temple which was open to all sects of Hindus and even persons of other religions could be denominational in character for the purpose of Article 26. When the independence of the Temple to pursue the practice of exclusion was sought to be justified by indicating that the Sabarimala Temple does not procure any state funding, the Chief Justice remarked that the only question was if the Temple is a public place, in which case noone could be prohibited from offering prayers to the deity. The hearing had witnessed positive, feminist observations from the bench, with Justice Chandrachud lamenting how women, from birth, are subject to social conditioning in terms of what they can or cannot do, and how the female is regarded as chattel of her male counterpart. The judge noted that the social dominance assumed by men could not justify this restriction on women so far as their communication with God by means of pilgrimage is concerned. Justice Nariman agreed that the supposed inability of women to observe the 41 day penance on account of impurity is a patriarchal concept. When Senior Advocate Abhishek Manu Singhvi Singhvi, appearing on behalf of the Board, had objected, saying that such patriarchy is prevalent in several faiths and social setups across the globe, Justice Chandrachud assured that the court shall endeavour to ameliorate the situation as far as their jurisdiction extends. Chief Justice Misra was also unimpressed by Dr. Singhvi’s submission that women not falling in the 10-50 years age bracket were highly revered among the pilgrims, with a special title dedicated to them. The Chief Justice asked why the same level of respect was not accorded to the menstruating women. The discussion had even veered to whether the impugned practice of exclusion of women amounted to ‘untouchability’ for the purpose of Article 17, as suggested by Amicus Curiae Raju Ramachandran. Senior Counsel Indira Jaising, for the petitioners, drew the attention of the bench to former Chief Justice B. P. Sinha’s dissenting opinion in Sardar Sayedna Tahir Saifuddin Saheb (1962), regarding excommunication as being akin to untouchability. The matter is pending for reconsideration before the court. The Chief Justice agreed that the argument based on Article 17 may be kept open, asking Ms. Jaising if she was suggesting a reference to a 7 judge bench. When she left the decision to the wisdom of the court, Chief Justice Misra stated that the issue may be dealt with separately. Chief Justice Misra also observed that the right to regulate religious affairs could not scale to the height of discriminating on account of the biological attributes of women belonging to a particular age bracket, while Justice Nariman noted that such a right would have to be conditioned on the Fundamental Rights of the public. While Senior Counsel Indira Jaising, Jaideep Gupta (for the state of Kerala), P. V. Surendranath, Raju Ramachandran (Amicus Curiae) and Advocate R. K. Gupta advanced arguments in opposition of the practice, Senior Advocates Abhishek Manu Singhvi, K. Parasaran, K. Radhakrishnan (for the Pandalam Royal Family), V. Giri (for the ‘Thanthri’ of the Temple), Kailashnath Pillai, K. Ramamoorthy (Amicus Curiae) and Counsel Sai Deepak (for the intervenor ‘People for Dharma’), V. K. Biju and Gopal Sankaranarayanan backed it.